Marine Survey & Technology Services (Pvt) Ltd., (MSTS) is one of the pioneering companies of the Ceyline Group. Established in 1988 the Company’s business portfolio comprises of a comprehensive and reliable Reefer Management Service, Surveys and other marine related services which are provided to customers while maintaining high international standards. While MSTS remains one of the forefathers in this trade in Sri Lanka, their reputation has gained strength over the years though the high quality services which they provide, making them the undisputed leader in the sphere they serve. Yet another feather in their hat was the awarding of the ISO 9002 Certificate from Det Norske Veritas (DNV) in the field of Marine Survey and Reefer Container Management becoming the first company to achieve such status in Sri Lanka. MSTS has remained the exclusive agents for global brands such as Daikin Industries and Star Cool and non-exclusive agents for Carrier Transicold and Thermo King Corporation. Over the years MSTS has gained a lucrative client portfolio which attributed to their high service standards. Their clients comprise of Maersk, APL, MSC, OOCL, Yang Ming, SCI, Mitsui OSK and PIL. 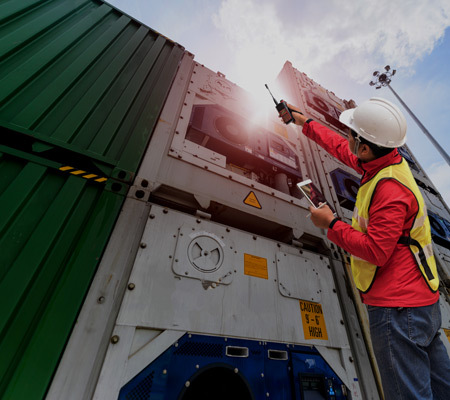 While also carrying out all reefer container monitoring operations in the newly built Colombo International Container Terminal in the Port of Colombo. MSTS, over the years ventured has into other alternative businesses such as vessel surveys, underwater services and bonded facilities for spare parts within the Port of Colombo and Hambantota. Marine Survey & Technology Services(Pvt) Ltd.